A multi-sensorial exhibition displaying the sights, sounds, and motions of Egúngún Arts, and a multi-disciplinary Symposium exploring sensory aspects of specific African ways of honoring ancestors. Please visit ‘Program’ page for full details. In conjunction with the symposium, the Ruth Davis Design Gallery hosts the exhibition Whirling Return of the Ancestors, a dynamic, multi-sensorial exhibition of sights, sounds, motions, and emotions. 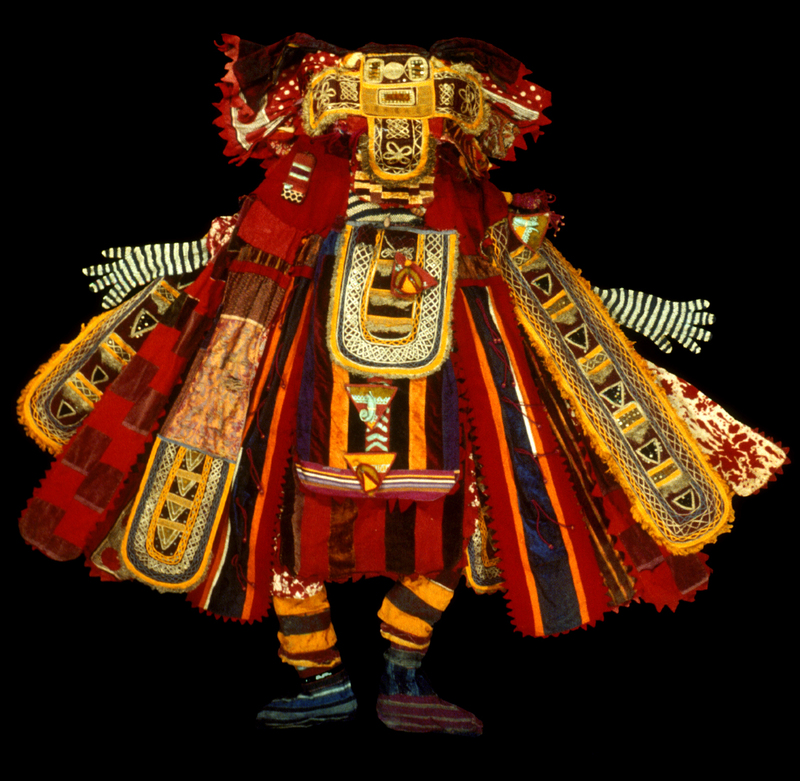 The exhibition presents the rich and varied artistry of Egúngún masquerades and other arts inspired by a tradition that honors and celebrates the power and eternal presence of ancestors among Yorùbá peoples of West Africa. This connection between the living and the departed is expressed in a Yorùbá saying: “The world is a marketplace [we visit], the otherworld is home.” (Ayé l’ọjà, ọ̀run n’ilé). Whirling Return of the Ancestors was researched, organized, and curated by students in the fall 2017 Art History Curatorial Studies-Exhibition Practice class taught by Evjue-Bascom Professor Henry Drewal. The project was developed in collaboration with the Ruth Davis Design Gallery in the School of Human Ecology (SoHE) and resonates closely with SoHE’s vision to inspire global intercultural experiences, reach new audiences, and welcome creativity through synthesizing research, outreach, and engagement. Henry Drewal has been developing his theory and method called Sensiotics – the study of the senses in the creation and shaping of persons, cultures, histories, and the arts – focusing on Yoruba-speaking people, or the followers of Mami Wata. The disciplines of art history, visual culture, anthropology, and other disciplines in the arts and humanities, as well as neurosciences, have in the last two decades taken a distinctive “sensory turn” – a perspective that has brought together artists, humanists, and scientists to explore how the body-brain-mind processes sensory data. The Western academy has for too long based its model on a mind-body duality, yet recent research, writing, and experimenting suggest that the body-brain-mind is a unified system in which sensory experience is constitutive of cognition. It is this perspective that will be explored during the symposium. It is geared to a multi-disciplinary academic audience of students and faculty and staff, and the general public in a two-day, multi-sensorial event involving not just “talking heads,” but sensing body-minds. The symposium will feature a series of short oral presentations (15-mins each) by renowned University of Wisconsin-Madison alumni scholars of African and African Diaspora arts and other distinguished scholars. Using the scholars’ own original data, we will mine the sensory aspects of specific African ways of honoring ancestors – arts and actions, past and present. The symposium will also feature an Egungun masquerade performance by members of the Oyotunji – a vibrant Yoruba community in the USA, who hold an annual series of festivals for ancestors and divinities. The most elaborate is their Egungun festival honoring the spirit of ancestors. An ensemble of musicians and masqueraders will perform at the symposium.